Ouuu! I'm so excited to share the release of two Paper Garden Projects Cooridinated Stamp Kits with you! I played with The "Happy Halloweenie!" kit and Tracy made some stunning creations with the Best Witches Kit. 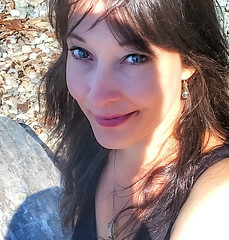 You can check out her sweet projects here. The patterned paper is ultra cute & embossed(!) & there are colours in it to go with anyone's favourites. 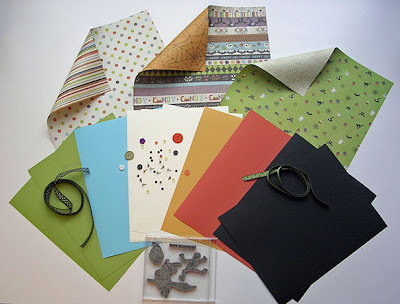 The textured Bazzil cardstock is wicked & the announcement cream cardstock stamps up scarily nice. available by the yard too. Step 1. Fold piece of Parakeet textured cardstock in half & edge with a black marker. Step 4. Add it to the blue card on top of the stage top decoration. embellish the sides, if you like. Step 9. 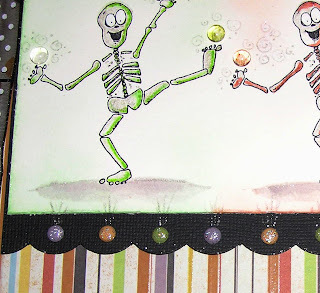 Adhere the skeletons image to the black mat & stick onto the "stage" Add lights by drawing lines from the sugared brads onto the white cardstock. Step 11. Punch the circles of patterned paper for the sentiment: (1 1'4 inch of Yellow textured cardstock, 1 inch of Wicked Whimsy patterned paper & 1 3/8 inch of Eat, Drink & be Scary paper) Edge them in black marker & adhere them to each other. Step 12. Emboss the "Happy Halloweenie!" sentiment (White ink & White embossing powder) & cut it out. 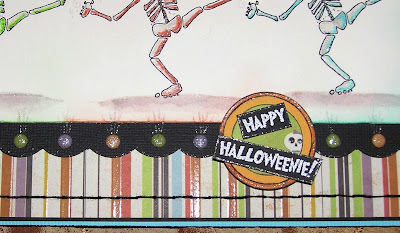 Layer onto the circles and doodle on it with the Sakura Star dust Gelly Roll Pen. Score to decorate if you like. Adhere it to the inside of the card at the bottom. This is my favourite part because these stamps are so CUTE! Step 4. Put the stick puppets in the pocket! Hi Mel these are super cool as always you inspire me, well done. Wow!! Fantastic..what an amazing project. I reckon this could be adapted for all occasions, what you think? Really well done!! This kit company has landed on their feet by acquiring you for their DT! The amount of work you put into your projects is phenomenal, and you show tremendous generosity in sharing all your processes (not to mention those wonderful lists of resources and links). No bones about it this project is amazing! Sorry I could not help myself! Seriously this is so so fun! Mel!!! I'm so glad we've met!! :) Your work is creative genius and just soooo inspiring!! How much fun are these! And how cute! Your Halloween projects are so fun! Creativity just oozes out of your! Gosh these are so cool. I want to buy this kit and make Halloween cards even though I have no idea who I would give them to. You did a super cute job on making the stage and those happy skeletons dancing. Very funny. Wow! How cool are those stamps with a way to see what you are stamping. So cute and fun! What a riot for everyone! You are damn talented missy!! OMG... this is so freakishly fun! Fantastic project that must have taken forever... great job! Totally awesome Mel. I love it. This is just too awesome. What a fabulous card. oh wow Mel! That is one FUN-tabulous theatre card! You put your ALL in each and evry card you make Mel! Its a good thing for the company..they chose the best there is! So cool...love the dancing skeletons! Congratulations on your design team status!! You're so talented I thought it would only be a mater of time. :-) Way to go lady!!! What a puny group you have collected here. :-) This is splendid indeed. I wish I had grandchildren to play this with... in time. AWEsome! FANtastic! INspiring! Gorgemous!!! You totally rocked this kit ... sheer genius! I want to crawl into your head and soak up some of your creative juices ... ewww, that sounds kinda gross! HEY! How come when you say stuff like this to me, it sounds healthy ... and fun?!?! ~Hugs, Mugs, & all like that kinda stuph!! This is an amazing project! I can see why Cathy has you designing for her. Awesome job! Its just too cute Mel. You never cease to amaze me with your creativity! Mel, you never cease to amaze me! This project is over the top cute, fun, and unique! Totally fun and interactive! That is amazing detail and you executed it just right! Does she sell these stamps without the whole kit? I just want the stamps! You do a great job showing us all the Possibilities... You GO, Girl! AWESOME is too mild a word for this. You are too much Mel. Love, Love, Love this project. Thanks for shareing it with us. These are jsut so so so so so so so so should I add another? i think .. SO CUTE!!!!! Love your stuff always! thanks for sharing.. I have several friend i am sharing this with! Just great!!!! This project is totally brilliant! What a great use of stamps to create something great for the kids! I love those dancing skeletons. OMGoodness! I just love this! Halloween is my favorite holiday, and what you've done is so cool!! I so love those images! This is soooo cute! Wouldn't every kid love to get this card!? Wowzers! What a fabulous project!! Love those stamps and puppets you made, toooooo clever!